Scientologists in communities around the nation and the world constitute a potent force in societys battle against such ills as crime, drug abuse and illiteracy, and have received extensive public acclaim for their work. They also assist their fellow citizens and their communities through a broad range of charitable events and activities, which play an equally vital role in community betterment. On any given day, you can find them teaching inner-city youngsters how to read, opening doors to learning and opportunity which would otherwise be denied them. You can find them with their sleeves rolled up in communities around the world, where they are most needed. And the value of their assistance has not gone unnoticed. California Governor Pete Wilson, for example, commemorated the 27th anniversary of the Church of Scientology Celebrity Centre International in Los Angeles with a special letter, read to more than 2,000 celebrants at Celebrity Centres anniversary party on August 3 by his personal representative. The Celebrity Centres dedication to improving the quality of life for its fellow citizens represents the kind of civic and humanitarian spirit upon which our society is built, Governor Wilson stated. 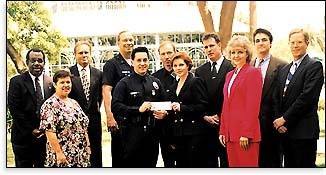 Whether you were raising funds for the Boy Scouts, the Hollywood Beautification Team, the Hollywood Arts Council, the World Literacy Crusade, the Hollywood PAL [Police Activities League] and Police Support Association; combating the scourge of drug and alcohol abuse and crime through your Narconon5, Drug-Free Marshal and Criminon6 programs; or having the Centres talented artists paint professional murals in buildings throughout the community  your members have been making a positive and lasting difference in countless lives for nearly three decades. In one recent and typical period of just a few months, more than 6,000 people attended benefits for a multitude of charitable organizations at the Celebrity Centre in Los Angeles  one example of one Church of Scientology helping its community. The Church of Scientologys long record of service to the community in battling crime and other problems was acknowledged by Captain Glenn R. Ackerman, recently retired as head of the Los Angeles Police Departments Hollywood Police Station. They helped us with our youth support programs, such as our Police Activities League, which we call PAL, he said. It is assigned to provide recreation and tutorial activities for children in Hollywood. They donated not only time and energy, but some very substantial financial support for that program to help out Hollywood youth. The Churchs support of such vital programs, aimed at providing positive activities for youth so they do not enter the dark world of drugs and crime, has set a standard for altruism for the entire community, he stated. He cited as examples the Churchs support of the Sparkle Program, aimed at cleaning up neighborhoods, and the key role played by the Church in Hollywood Night Out Against Crime  attended by thousands, including the Mayor of Los Angeles and many other dignitaries  where Scientologists provided the stage for the event and the evenings musical entertainment, featuring such stars as Chick Corea, Mark Isham and Edgar Winter. The Atlanta chapter of the Churchs Drug-Free Marshals drug prevention campaign responded to a call by the city of Atlanta to ensure inner-city youths were not forgotten during the excitement of the Centennial Olympic Games and conducted a 21-park tour during the competitions to encourage young people to say No to drugs. The Marshals quadrupled their activities in the Olympics host city over the summer, with events nearly every day at parks throughout Atlanta. We also expanded the scope of our program to include information about steroids and other harmful drugs that children might hear about in connection with the Olympics, Stein said. At a ceremony to commemorate the dedication of the children participating in the Drug-Free Marshals program, Georgia Governor Zell Miller proclaimed July Drug-Free Marshals Month. [T]he Church of Scientologys Drug-Free Marshals program is educating children and helping them understand that in order to achieve their goals, they must remain drug-free, his proclamation stated, in part. After signing the document in the presence of a number of Drug-Free Marshals, the governor was asked by one of the children to become an honorary Drug-Free Marshal himself. He agreed, then took the Marshals pledge to live a drug-free life and to encourage others to do the same. He will make a great drug-free role model for kids, said Eva Benk, a 10-year-old Drug-Free Marshal. Nearly 1,000 children were sworn in as Drug-Free Marshals as part of Scientologists support of the Olympics. 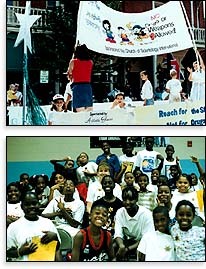 Other activities by Scientologists during the games included the delivery of hundreds of assists to athletes and visitors. An assist in Scientology is an action to aid an individual in facing and alleviating physical discomforts or injuries. Booths were established in the area so assists could be delivered to individuals in need, while teams of Volunteer Ministers circulated among athletes and visitors, helping where needed. Many copies of a special booklet describing how to administer assists were distributed to athletes and coaches. In the wake of the terrorist bomb attack in Centennial Park, Volunteer Ministers of the Church of Scientology were the first on the scene, working through the night to provide assists to victims and to aid the rescue teams. Just as it is in Georgia and California, so it is in other communities as Scientologists help where they are most needed.